Note: Outdoor waterpark defined as an aquatic facility without attached hotel having 3 or more slides. 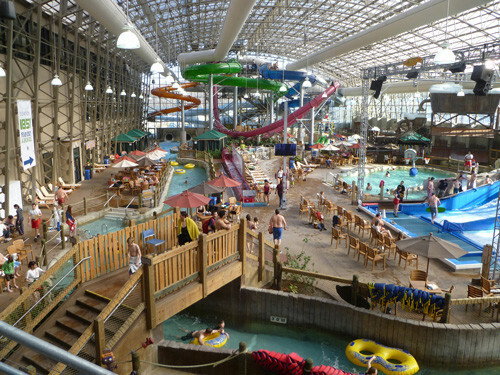 Note: Indoor waterpark defined as a hotel with a minimum of 10,000 square feet of indoor waterpark space. Note: Standalone indoor waterpark defined as a hotel with a minimum of 10,000 square feet of aquatic area and featuring multiple water features. More than 400,000 square feet of indoor waterpark space and over 1,400 rooms are planned for 2015. The two largest indoor waterpark resorts, Camelback Lodge and Kalahari Resort, are opening in the Poconos region of Pennsylvania. Indoor Waterparks & Resorts City New Rooms Indoor Waterpark Sq. Ft. The U.S. supply of waterparks is dominated by outdoor waterparks. In 2015, three private and 12 municipal parks are expected to open, for a total of 15 waterparks. Outdoor waterparks can enhance a hotel’s amenities and attract additional guests. They may be the deciding factor when it comes to family lodging options. Margaritaville is expected to open this year with surf simulators and multiple pools. Existing waterparks at Dollywood (Splash Country) in Pigeon Forge, Tennessee, and Legoland in Winter Haven, Florida, are adding hotels this year, taking them from outdoor waterparks to resorts with outdoor waterparks. Four Seasons Resort at Walt Disney World Orlando FL Waterslides, lazy river, splash zone. Many new and existing parks are looking to the latest trend in recreational water entertainment to set them apart. Simulated surf machines provide a skill-based entertainment option and spectator sport. Surf simulator brands include FlowRider and FlowBarrel by WaveLoch, Whitewater West, and Aquatic Development Group; SurfStream by American Wave Machines; and StingRay by Murphy’s Waves. The waterpark industry continues to grow and thrive. Waterparks have proven themselves as fun, safe, and much desired vacation destinations for families with children. In an effort to select a vacation with children’s interests in mind, more families look to waterpark resorts to provide a true family vacation experience that has something for everyone to enjoy. At the local level, outdoor waterparks attract visitors from the surrounding areas who want the waterpark experience closer to home.